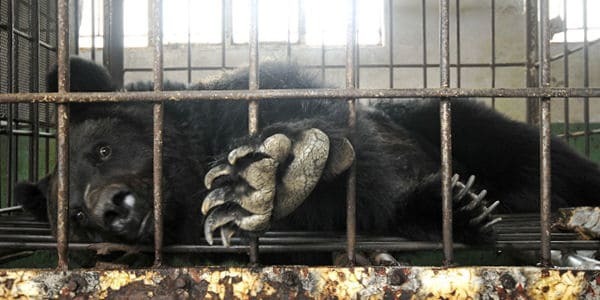 Bear bile farms are horrible facilities that steal and illegally import wild bears from their natural habitat and pump them for their bile, which is used in Asian medicines. 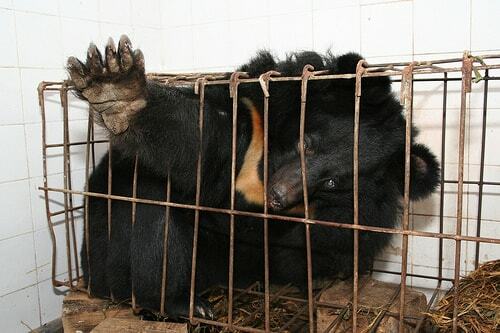 Wild bears are very intelligent, resourceful, and tough, but bile bears are kept in a tiny cage once they are caught and forced onto their backs to endure painful bile extraction over and over for the remainder of their lives. They are poorly treated and are completely deprived of social interactions. Though their bile has proven to have no medicinal value, the practice of using it as a cure-all remedy in some Asian cultures. Most of the bears, which are primarily sun bears and Asiatic black bears, are drugged and tied by the claws to a table, where a “draining apparatus” extracts bile from their gallbladders. Some unlucky bears live with a permanent catheter inserted so that it can constantly extract the yellow liquid. One huge breeding ground for these facilities is in Laos, a country bordering China and Thailand. Illegal trading of wildlife and their parts is prominent in this country because of its proximity to China, where bile farming and the use of bile is still completely legal. China also the highest demand for bear bile, making the industry both profitable and consistent. “A combination of weak laws, poor enforcement and official complicity in Laos allows the illegal wildlife trade to openly flourish,” a 2015 report by the Environmental Investigation Agency said. However, representatives from the Democratic Republic of Laos came to the Convention on International Trade for Endangered Species (CITES) conference with some good news. They said that the country intends to promptly close all bear bile and tiger farms within their nation. Though the farming itself isn’t illegal, the selling and purchasing of endangered animals is forbidden, and it’s alleged that these unlawful trades are how farms get their bears. The CITES secretariat and UN agencies have visited farms several times to investigate the possibility of illegal trading. After their announcement, the founder of Wildlife Friends Foundation Thailand traveled to Laos to inquire about the shutting down of “one of Laos’ most horrific bear bile farms” and devise a plan of action. They plan to close the facility and then bring 40 bears to the Laos Wildlife Rescue Center to live out the rest of their life in a sanctuary with lifelong care. These tortured bears will soon get a second chance at life, love, and happiness with organizations lie WFFT keeping an eye on Laos to make sure that they follow through on their promise. This article (This Country Just Vowed To Close Horrific Bear Farms And Send Bears To Sanctuaries) is free and open source. You have permission to republish this article under a Creative Commons license with attribution to the author and TrueActivist.com.